So you've got a video monitor installed in your nursery to keep an eye on your baby while he is sleeping. Unless you keep staring at it for hours, a video monitor may not be enough. And to be fair, you wouldn't want to keep such vigilance for the next six months, would you? A movement monitor, or rather, as some would call it - a breathing monitor is what you need to give you ease of mind. This is a monitor that alerts you when baby stops moving (or breathing). Some monitors will even keep track of your baby's sleeping position and breathing rate. While this will not prevent Sudden Infant Death Syndrome (SIDS) (note: there is no one external device that is able to do so), it does add another level of protection on top of your video monitor. Read on to find out how you can get yourself a few hours of peaceful sleep with the best baby movement monitor in the market. 3. So, Which is the Best Type? Clipped-ons. These are the type where you clip the device onto your baby's diaper and it will monitor through baby's abdominal movements. They are usually very light and portable, making them the best infant breathing monitor for travelling. Sensor pads. 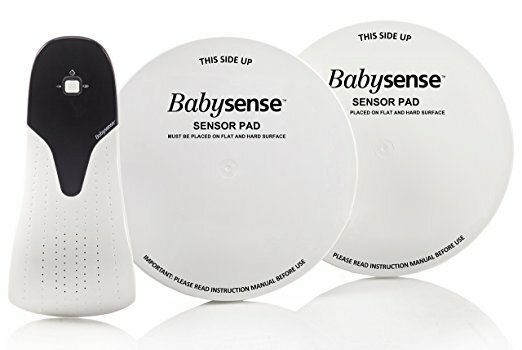 These type of monitors sense baby's movement through a sensor pad, which is to be placed underneath your baby's mattress. 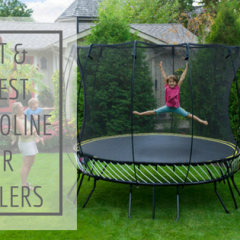 Most would need to sit on top of a flat, solid surface which if you have a spring base or slat base crib, you will need to lay something (like a plywood) over your crib base first, or you can get one of these. This is the best baby monitor with movement sensor type if baby is going to be sleep at the same crib every day. Both clipped ons and sensor pads are the more traditional breathing monitors that have existed for a while. With the advancement of technology nowadays, there are now app-based monitors that are linked to your mobile phone or tablet for you to keep track. There is no particular preference or ranking order in this movement monitor review this time around as we've reviewed the best baby sleep monitor in each of the category so that you can choose one that best suits your needs and lifestyle. We have now reviewed the best baby sleep monitor in each of the category for you to choose one that best suits your lifestyle. Snuza Hero Baby Movement Monitor is the best baby breathing monitor for those who travel a lot. This is a clipped-on type of movement monitor. Shaped like an old school beeper and weighing at just 0.6 pounds, it is easy to pack it in your diaper bag when you go travelling. How it works is that you clip the Snuza Hero to your baby's diaper and turn it on. It will then monitor baby's abdominal movements and detect even the slightest of movements. If abdominal movement is weak (less than 8 movements per minute), it will alert you. If the Snuza Hero detects no movement for 15 seconds, it will vibrate to arouse your baby to resume abdominal movement. Usually, this will suffix and baby will return to breathing normal. However, after three vibration/rousing incidents, a Rouse Warning will alert you that movement has stopped for 15 seconds on three occasions. If an additional 5 seconds of no abdominal movement is detected, a sharp audible alarm will sound to alert you. This alarm is 80 decibel which you can hear from the next room. If you are unsure whether the clipping will be secured enough, rest assured it is because many parents have raved about how little to none it is in terms of giving false alarms. We recommend that you fold the diaper down a little and clip the Snuza Hero onto it (make sure it goes all the way down) to prevent it from falling out. The Snuza Hero will pick up external movements so you should not be using it if you are co-sleeping or baby is bed-sharing with his twin. You should also not use it when baby is in motion (i.e. in a car seat or stroller). While the Snuza Hero is priced at a reasonable price point in comparison to other brands in the same category and for its high quality, if you are looking for a more affordable alternative, you can consider the Snuza Go Portable Baby Movement Monitor, another one of the best breathing monitor from the same brand with very similar functions. he Hero detects the slightest of movements and will alert you if abdominal movement is weak or less than eight movements per minute. If the Snuza Hero detects no abdominal movement for 15 seconds it will vibrate in an effort to rouse your baby to resume abdominal movement. Often the vibration is enough to rouse the infant and Hero will revert to monitoring mode. However after three vibration/rousing incidents, a Rouse Warning will alert you that movement has stopped for 15 seconds on three occasions. If an additional 5 seconds of no abdominal movement is detected a sharp audible alarm will sound. The Snuza Hero can pick up external movements and it is therefore not suitable for co-sleeping or bed-sharing. It is advisable not to use the Snuza Hero when the baby is in motion, e.g. in a car seat or a stroller. 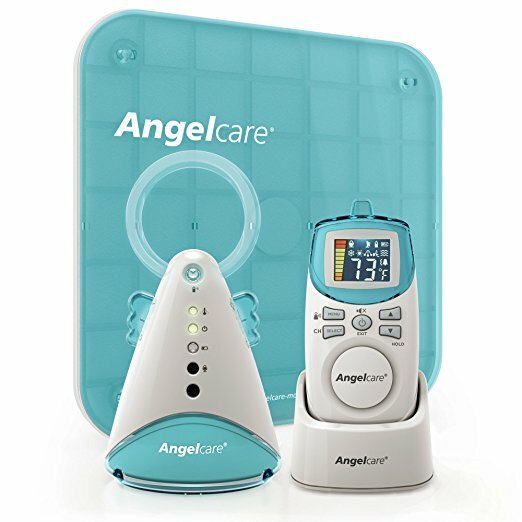 This particular model AC401 of Angelcare Movement and Sound Monitor is another best movement and sound baby monitor in the sensor pad category that we'd highly recommend. If no movement is detected after 20 seconds, an alarm will sound. Or, you can manually adjust the desired movement sensibility level to whatever timing that eases your mind. You can also hear every single sound from your baby's room on your portable Parent Unit, which also displays nursery room temperature and other extras on a fully coloured digital display. Because of the portability and rechargeability of the Parent Unit, this is considered one of the best baby monitor for two rooms as you can carry it from room to room for peace of mind. Little thoughts like a gentle night light to guide your way into the room is one of the reasons why this monitor is so loved by parents. This award-winning movement and sound monitor is a true value for money because you can convert it to audio only once your baby turns 1 or 2 years old to continue monitoring him through sound only. If you have twins or more, you can buy the AC300 movement monitor (the best baby monitor for twins) to pair up with the AC401 as they are perfectly compatible with one another. If you have triplets, simply get another AC300 and they will work. Given its coverage of up to 820 feet (open field) and between 262 and 328 feet (indoor), Angelcare Movement and Sound Monitor is one of the best long range baby monitor to keep track of your baby's movement and sound. An alarm beep will let you know if you are out of range. This sensor pad is meant to be placed underneath your baby's mattress. You don't have to worry about whether your mattress is too big or too thick - as long as it is a regulatory standard baby mattress, it will work. However, it does has its limitation - memory foam, dual sided, mattress with a hollow frame or Purflo mattresses will not be suitable. As with sensor pad monitors, you will need to lay it on top of a solid surface. If your baby will be sleeping in the same crib most of the time, then you will not go wrong with the Angelcare Movement and Sound Monitor. If, on the other hand, s/he will be travelling rather frequently, then the Snuza Hero is the best movement monitor for you. However, it does has its limitation - memory foam, dual sided, mattress with a hollow frame or Purflo mattresses will not be suitable. If you do not need the fancy functions of Angelcare AC401 - all you need is the easiest to use baby movement monitor, then the Babysense Hisense 5s Baby Safe Infant Movement Monitor is the best baby motion monitor for you. This is another sensor pad type of breathing monitor that is to be placed underneath your baby's mattress (make sure there is a solid base). It will sound an alarm if no movement is detected for more than 20 seconds. While you cannot change its sensitivity level (unlike Angelcare AC401), it does have an extra function of alerting you if baby's movement rate slows to less than 10 micro-movemens per minute. The high sensitivity of this monitor is very reliable and with two sensor pads covering the entire crib area, you can rest assured that the Babysense Hisense is able to detect even the slightest movement through the mattress. There is only one button on the control unit for you to switch on the sensor. That's it! We're sure many of us would appreciate not having to go through various buttons or functionality, especially in the middle of the night. It features a 'hidden cable installation' to avoid possible strangulation danger so this is very safe. 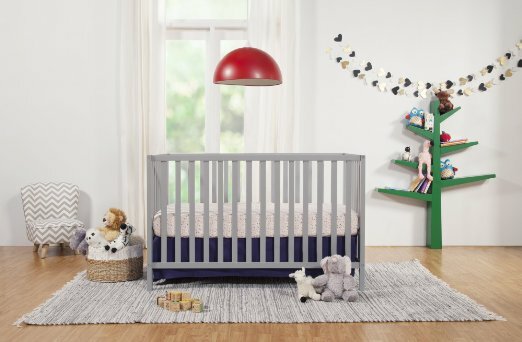 The indicator light will only hang right off the bottom of the crib and the monitor will not be affected by wireless interruption of other electronics. As there is no parent unit for this breathing monitor, this is not a baby monitor with best range. We therefore recommend getting the Babysense Hisense only if you are room sharing with your little one so that you can hear the alarm when it sounds. Or, if you already have an audio or video monitor, then we think the BabySense Hisense 5s Baby Safe Infant Movement Monitor is an excellent and reliable piece to add to your baby surveillance gadgets. Otherwise, if you like the simpleness of it and want to get it even though you are not room sharing, here is a good deal - this bundle set which comes with one of the best wifi baby video monitor! This app-based type movement monitor is the new and optimised version of the hugely popular MonBaby Smart Button, one of the best baby movement monitor. Quite different from the standard clipped ons and sensor pads, this breathing monitor uses a small, plastic button that is to be attached to your baby's clothing to track your baby's movements. Not only that, it also alerts you about your baby's sleeping position. If low breathing or any movement stoppage or any irregular activity is sensed, the Smart Button will send an alert to your smartphone or tablet directly. While it works optimally when placed in the same room with your smartphone, you can easily extend the range via its free MonBridge app that is compatible with all Android and Apple smartphones for you to monitor your baby from another room. As long as you keep your phone with you, you don't have to worry about not being able to hear the alarm sound or being out of range. If this is not the best long distance baby monitor, what is? The New MonBaby Smart Button has a universal form factor design that will fit over any typical baby clothing so that your baby will not outgrow it. If your baby is a light sleeper who get disturbed easily by light or sound, know that the Smart Button does not produce any sound, light or vibration while actively monitoring your baby. All audible alerts will just go straight to your phone. Despite being pricier than most traditional clipped ons and sensor pads, the New MonBaby Smart Button is the most affordable app-based monitor on the market. It comes with everything (including extra battery and a mini screwdriver) you need for immediate and continued use. Ah, this one. This Owlet Smart Sock 2 - Baby Monitor goes beyond the standard movement monitor - it tracks your infant's heart rate and oxygen levels to. Looking for the best breathing monitor? This is the one! Quite different from what you have seen with movement monitors, the Owlet Smart Sock uses a sock, yes, you read it right, to monitor your baby. By putting on this sock onto your baby's foot, it tracks your baby's heart rate and oxygen levels by sending all information collected to a base station. This is where a notification (with lights and sounds) will be sent to you via Owlet's own app if something appears to be wrong. This app also allows you to view real-time your baby's wellness data aside from receiving direct notifications on your phone. This smart sock sensor uses pulse oximeter with bluetooth technology to monitor your baby's wellness. It is designed for babies of 0-18 months of age and it uses hypoallergenic cotton fabric to ensure no allergies are caused. It comes with 3 different sizes of socks so that you can use it accordingly with baby's growth. With socks like these, you do not have to worry it will fall off your baby while he sleeps. Now, the Owlet Smart Sock -2 Baby Monitor does not come cheap. Its price is definitely steep and not for everyone. However, it is one of its kind in terms of tracking heart rate and oxygen level - not many monitors are able to do that so if you need the best baby monitor breathing sensor, this is the one for you. Lately, app-based movement monitors like the New MonBaby Smart Button and Owlet Smart Sock 2- Baby Monitor are giving traditional clipped ons and sensor pads a serious run for their money. They are not as bulky as the standard clipped ons, and are much more convenient mobility wise because you can put baby to sleep anywhere - the bassinet, the crib or the playard, instead of being limited to just the crib for its sensor pads. However, the price point of app-based movement monitors is certainly a factor to be considered, although the New MonBaby Smart Button is, surprisingly, very affordable given its very high quality. If your baby requires more surveillance than others i.e. 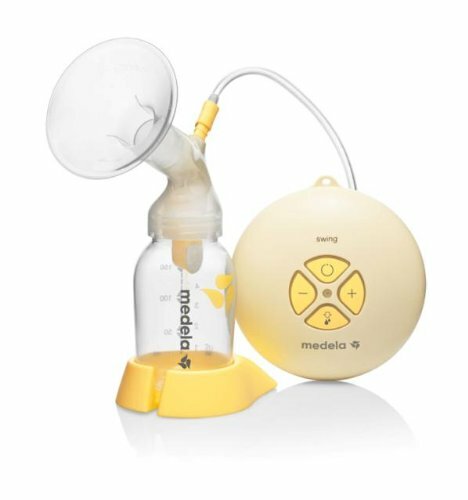 s/he may be a preemie or has some complications that require you to keep a very close eye on, standard clipped on breathing monitors like the Snuza Hero may be more suitable for your situation because it has a rousing function that no other movement monitors have. It is one of the best baby monitor for sids. Most of the time, your baby is perfectly fine so this rousing function will help reduce the number of times you go running checking on your baby's condition due to a false alarm. In a way, it gives you more peace of mind. It all comes down to personal preference and your individual requirement at the end of the day - what may be important to someone may be the complete opposite of what you want (e.g. the rousing function may not be needed for your baby/ it may disrupt your baby's sleep). 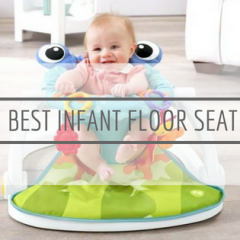 Whichever you choose from our review above, you can be sure that you have the best baby movement monitor in your hands to get that extra few hours of peaceful sleep for yourself.